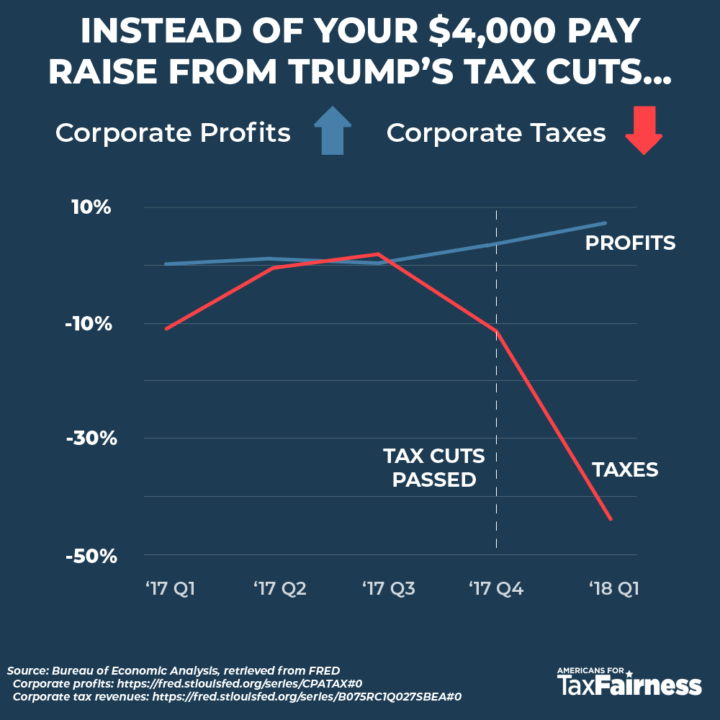 WASHINGTON, D.C. – As you prepare editorials and messages to honor American workers this Labor Day, we urge you to consider the enclosed research and data showing how the Trump-GOP tax cuts are affecting workers and how they are faring in the current economy. President Trump promised that employers would use their large tax cuts to give working families a $4,000 pay raise. But it hasn’t happened. Meanwhile, wealthy CEOs and corporate shareholders are enjoying a different Labor Day this year because of Trump’s tax law, which will cost $1.9 trillion according to the Congressional Budget Office and blow a big hole in the deficit. And when the law is fully implemented, 83% of the tax cuts will go to the richest 1%, per the Tax Policy Center. Only 4.4% of workers have gotten a pay hike connected to the corporate tax cut—just 7 million out of a total workforce of 155 million. Most of those are getting a one-time bonus, not a permanent wage increase. Corporate tax cuts are not trickling down; very few workers have more money in their pockets. Wages after inflation for all workers have actually fallen over the last year, declining 0.2% for all employees (private non-farm) from July 2017 to July 2018. And even for workers that got a raise, it’s being eaten up by higher prices for prescription drugs, insurance premiums and gasoline. CEOs and rich shareholders have benefited the most from the corporate tax cuts. Since the tax cuts passed, corporations have announced stock buybacks of $712 billion—100 times more than the $7.1 billion corporations have promised workers in pay hikes. Stock buybacks overwhelmingly benefit the wealthy because they own the vast majority of stock. Corporate profits are up, and corporate tax revenues down. Between the last quarter of 2017 and the first quarter of this year, after-tax corporate profits were up 8.2% from $1.8 trillion to $2 trillion, according to the Bureau of Economic Analysis. Annualized federal corporate tax revenues were down 44%, from $264 billion to $149 billion. To help reduce the deficit caused by their tax cuts, President Trump and the House GOP have called for cutting health care—Medicare, Medicaid and the Affordable Care Act—by $1.3 trillion to $2 trillion, or roughly the cost of the tax cuts. A better way to celebrate American workers this Labor Day, would be to repeal Trump’s tax cuts for the wealthy and corporations and use the money to invest in America—to repair roads and bridges, expand broadband to rural America, make healthcare more affordable, improve public education, and ensure seniors a more secure retirement. In other words, let’s help working families get ahead instead of rich CEOs, Wall Street banks, drug companies, health insurers, and Big Oil, who are getting the lion’s share of the benefits from the Trump-GOP tax cuts.